CAPTURING: It was clear early on that taming the kittens so that they let me catch them in the barn was not going to happen. 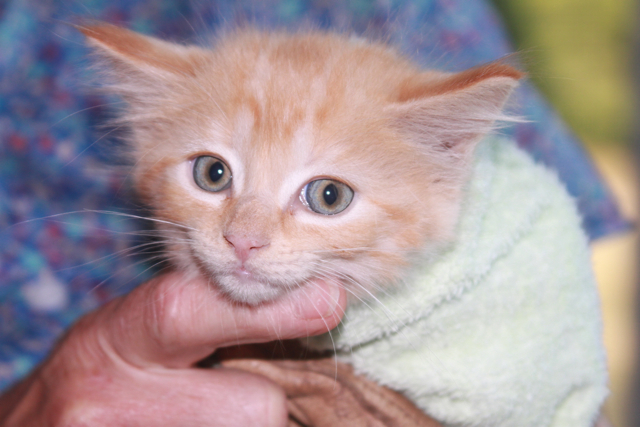 If you want to start socializing kittens when they are within their defined period of socialization (3 to 7 wks, although that doesn’t mean you can’t do it later) you most likely need to capture them with some kind of trapping method. Lots of folks on FB told me they had had luck with trad’l live traps, but there is a danger that the door could slam on one kitten while following another who is already inside. I also hated the idea of a very young kitten trapped in 100 degree weather for up to 8 hours, so I used the low tech, tried and true method of building a trap (a huge old dog crate), attaching a string to the door, and conditioning the kittens to come inside when I was sitting about 15 feet (20?) feet away. The plus side here is that once the kittens are trapped you know it, and can handle it right away. You also know what you’re trapping: I didn’t want mom yet until I had the kittens, nor a raccoon (possible), a rat (possible), or a weasel (fill in the blanks). The downside is obvious: you have to sit outside forever waiting for the kittens to venture inside. (Try your hardest to avoid a record setting heat wave that means it is still 95 degrees at 9 o’clock at night.) I used chicken as a lure, first tossed it within 5 feet of the kittens and then withdrew, gradually moved it closer to the crate and eventually inside. I left food inside twice a day for 3 days before I tried to pull the door shut. I tried to make the timing predictable. Although I carefully tested pulling the door shut (note the comment on FB about someone who pulled the string but the door didn’t close well enough) it STILL didn’t work the first time I pulled it shut with 2 kittens inside. The string got hung up on a bungi cord and the kittens easily slipped out. That actually turned out to be a good thing: they weren’t that frightened and came right back in and this time the system worked. There also weren’t other kittens out who could see what happened; one of my criteria was to get all the kittens in the area into the crate before pulling the door shut. I didn’t want one kitten outside seeing what happened and avoiding the crate from then on. 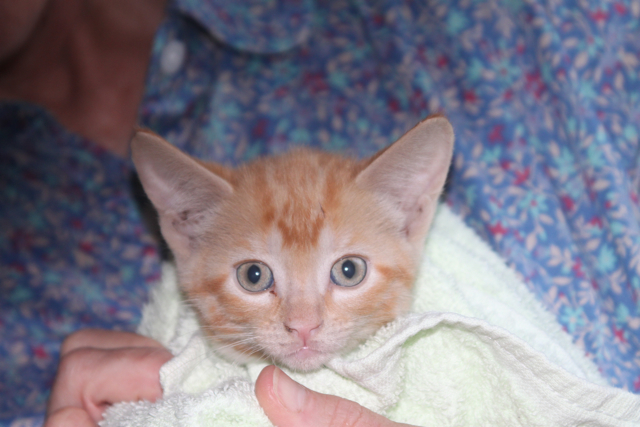 On Wednesday night two kittens showed up and after teasing me (one in, one almost in… other in, one almost in….) both finally went into the crate and I pulled the line in like a fisherman with my heart pounding. Success! I covered the crate and carried it, kittens scrambling and yowling, into the house. The next morning, yesterday, I caught 2 more. No sign of the 5th, but I have high hopes he is still with him mom. I’ll start again this weekend trying to trap them. WHERE SHOULD YOU PUT THEM? The answer is simple: In a small space. I put them in the downstairs bathroom, a pretty small room where they immediately took refuge behind the toilet. That’s fine. They are easily caught or fed there, and there’s no chance they’ll be able to run away. The last thing you want is to chase them and teach them that they were right to be afraid of you in the first place. If you don’t have a small room, use a crate. TOGETHER OR ALONE? Until now the kittens have all been together, but it seemed to me that they’d socialize faster if a human was their only social companion. Kelly Sorensen, feral kitten socializer of Dane County Friends of Ferals extraordinaire, agreed. So Jim brought home another litter box, and after we took the photos below we moved the two ginger boys to an upstairs bathroom and keep Calico girl by herself downstairs. I might separate the boys too, but that does make time with each of them more complicated. It’s all a trade off of what’s best for them, how much time you have and the logistics of life. FEEDING: Food should come from you and you alone. I came into the room about 5 times a day with food (okay, I’m fessing up, my productivity has taken a dive, no question). I entered trilling like a queen cat returning to her litter with food. FYI, it took me 4 years to learn how to trill–I’ll try to make a recording of it and put it on YouTube next week. I have no idea if it had any effect on the kittens, but it does serve to condition them to expect something good when you enter. Here’s a great tip I learned today from Kelly: Instead of putting the food down on the floor, with the idea of bringing it closer and closer to you (which I’ve done with some success), it goes much faster if you put the food at the end of a long spoon and let the kittens lick it off. I found I could get my hand within a foot of them with no hissing from Brave (aka Hissy-Boy, more on him later!) Don’t worry if they are too frightened to eat the first night, that is a common side effect of cortisol production and is expected. I wasn’t worried that the first 2 didn’t eat that night, but was glad to see them eat the next morning. Whenever I left I did not leave food in the room for them: Again: YOU = FOOD and are the sole source of it, don’t let them eat when you’re not at least in the room. If you are getting worried that they haven’t eaten, Kelly suggested putting the food on the end of the spoon and leaving it there, thus getting them used to eating from a spoon. In a day or two you can pick up the spoon and let them eat off of it while you hold it. Smart. HOW LONG WILL IT TAKE? Ah, there’s no answer to that question, because the answer is in the details. What are their genetics? How inherently shy are they? How much time do you have to spend with them? I’ve heard everything from 3 days to 3 weeks. One thing you can predict: the hissiest, growliest one will be the first to tame and the quiet, shy one in the corner the last. It makes sense when Kelly explains what she thinks is going on: all the kittens are frightened, but the hisser is the one brave enough to act on his fears. “YOU! He says. “YOU ARE BEING WARNED! I HAVE WEAPONS!” Brave hissed so much yesterday that I started laughing at him. He’s much much better today, but I have to give him credit for being the one to step up to the plate and try to defend himself. I mentioned it last week, but another good source of information is Alley Cat Allies and on a related topic, Pet Detective Matt Elvin’s website is a great source for information about a lost cat. ‘NOT BRAVE’ looks like a ‘Sage’ to me. Bless you for taking so much time to give these little ones a good start in life. Congratulations on capturing 4 of the kittens. I’ve been following along on Facebook and on your blog and it’s been fascinating. I would love to take one of the kittens and I don’t live very far from you, but my husband isn’t quite ready for a cat to join our household yet. We lost our last cat last fall at age 18; he was the last of 3 littermates that we had for all of their lives. We had 7 cats at one time (which is when my allergies to cats really flared up) and now for the first time since I was very young, my household is without a kitty and I so miss not having one! Good luck placing them; I know you will find good homes very soon. Meanwhile I’ll keep working on convincing my husband that our 3 dogs need a feline brother or sister, hopefully sooner rather than later! Little not as brave looks a lot like my Meowzart http://www.flickr.com/photos/33350160@N02/6316888943/in/photostream/ (the grey tuxedo is The Great Catsby). I’d name your little guy Amadeus. Of course I have a great fondness for punning with the names of my cats and have been promising that the next cat will be Meowmar Clawsoffie as in Meowmar get your claws offie the sofa. It sounds to me like this family of cats picked the right barn to move into! Lucky lucky cats. Name for “Not Brave” … you’re going to get 10 dozen suggestions, so I’ll get mine in early. “Wise Man” would be a nice complementary to “Brave” but that’s probably too long. Substitute: Shaman. Very lucky kittens, and thank you so much for carefully explaining your actions in this process. It has been a good reminder of the value of patience in dealing with “alien creatures” such as these. Not Brave? How about “Courage”… seems like a name he could not only use but grow into and develop. Hmmm…. if you’re not “Brave”, you’re timid (?). How about Tim? Love reading all your stories!! Hope you get the last kitten and mom soon! The calico girl is adorable! My last cat was that color. Funny how I have lived with dogs /played with dogs/am never without a dog, and yet I have to say SHE had my heart. It’s been 7 years since she passed and I never got an other. Looking forward to see her grow up. Good luck finding mom. What about Julius or Sampson? Not brave is the color of a wine cork therefore “Corky”. To Inna: I am truly grateful for the advice from Dan and Kelly, they’ve been great. Dan generously drove out with a trap for me to borrow to eventual use on mom once the kittens were captured, and Kelly is an excellent source of information regarding socializing feral kittens. She’s a great resource! However, to keep things accurate, your website says F of F helped trap kittens and mom. Mom hasn’t been trapped yet, so cross your paws on that one. And if anyone wants more information on my “Lo-Tech-Capture-Kittens-in-a-Great-Pyrenees-Crate-with-a-String-Method” just let me know! I completely agree that young kittens like this can be handled against their will (if you will), but that older kittens and adults should be approached differently. When I once took in a feral kitten who was about 4 months old, I set him up in his own room with food, water, litter box, window perch etc and started by just sitting in the room for a short time (20-30 minutes) a couple times a day reading and not even looking at him so that he got used to my presence. I let him take his time to come close to me, tempting him with treats or canned food set closer and closer to me until he eventually allowed petting. He was a wonderful cat that I had for 15 years, and although always shy of strangers, did well with me and with other cats. The most important thing with the older kittens and adults to to let THEM set the pace! I can personally attest to the fact that grabbing kittens and forcing them to see how wonderful being stroked is really helps! I’ve been following with interest. Glad it’s going so well. Such cute kitties! Other male characters in the movie “Brave” are Fergus, MacIntosh, and Dingwall. I would go with Fergus (Fur-gus?). No animal deserves to be called Dingwall. Love all your names. And after requesting them, I’m willing myself not to choose any. The boys go tomorrow and I’m having a little trouble with the whole separation thing. As much as I am completely, ridiculously smitten by Calico girl, I am absolutely in love with Brave. I think if I come up with any more names I’ll just melt into a useless puddle of oxytocin. By the way, Mom is doing okay as best I can tell. She’s eating and drinking and that’s about all I can say, no way would I try to handle her, she’d be terrified… and she’s had enough of that for awhile. I’ll let her out of the crate tomorrow, paws crossed. I’ve been following with interest this kitty saga. I’m not a cat fancier, but the story is good. Then it struck me what is so fascinating: Trisha, your curiosity and ability to find interest in so many things coupled with your absolute determination to follow through and get as much information as possible is truly remarkable. To sit out there with small pieces of chicken in 100 degree heat in the hopes that it will eventually lead to sitting out there in 100 degree heat with tiny pieces of chicken and an old dog crate which will hopefully lead to capturing a few kittens in the least traumatizing way possible in the hopes that the kittens will be able to be socialized to people in the hopes that they will find good homes. I admire your scientific smarts coupled with your humane approach and the patience of Job. Inspiring, thanks. Little OJ kitten took about 3-hours to tame! She hissed and cowered for awhile, though was eating chicken slices out of my hand the first evening, and by the next morning, was showing her belly, purring and following me around the house. She is one of the most gregarious kittens I’ve ever met. She greets us at the door, and always want to know where we are. Thanks, Trisha, for contacting us when you did – we’re so glad the former OJ (now Amelia) is part of our lives. Yeah Scott and Collette! Amelia is a lucky girl indeed, I’m thrilled that you have her. And I’m happy to report that Calico girl (Callie? Still not sure.) is doing the same. She meows for me to come in, rubs and goes belly up instantly. 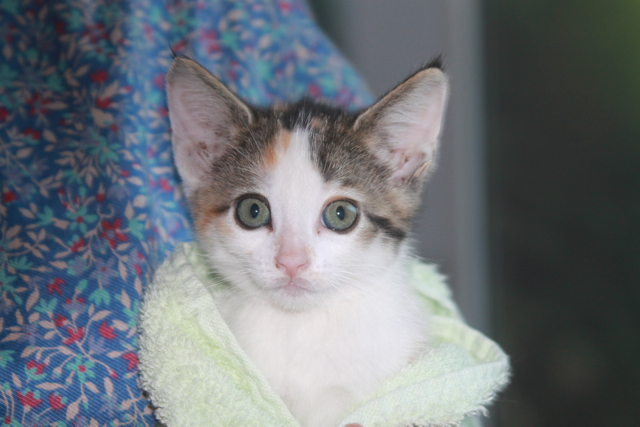 She’s playful and super affiliative and a lovely, lovely little kitten. Yesterday she went to the office in the morning and the vet clinic in the afternoon; she’s become quite the traveler. It’s all I can do to not spend all day with her… good luck to me getting her put back into the barn. Oh dear, that’s going to be a challenge. Right now I’m awaiting her mom to leave the large dog crate she’s been in since Sunday after her spay. She’s still there after 2 hours, with the door wide open. I’m a tad concerned that’s she’s okay. Will check again on her soon. Yippee for Amelia and Callie! When I brought 4-5 month old Fiona into the house, her first day was a very traumatic one that involved the cat carrier, the car, the vet, and her first intensive handling in her whole life. When we came home from the vet, I put the carrier in a central but sheltered place (under the coffee table) and opened the door. I expected her to streak out and find a hidey hole, but she was so exhausted from her ordeal that she spent nearly seven hours mostly asleep in the open crate. I think that a crate can become a “safe” spot very quickly to a stressed animal, particularly compared to the terrifying unknown of a new environment. Once she came out, Fiona tamed almost instantly and very quickly became the cuddliest, sweetest cat I’ve ever personally known- she loves being held and carried (will leap onto a shoulder or into our arms, in fact) can hardly be pried out of our laps with a crowbar, plays fetch, and comes running whenever called. The doggiest cat I know. I’m so happy to hear that Amelia and Callie are coming along so well. Ferals truly can become very social pets. How are the kittens doing? Having been forced to more closely examine feline behaviour by virtue of starting up a petsitting business 8 years ago (I am, by nature and experience, a Dog Person) I agree with and applaud everything you have done and are doing. Quite surprised, though, to hear that “Amelia” is being hand-fed! Very, very few cats — my own two included who I have tried and tried to get them to accept morsels from my fingers — will eat from the hand, preferring “hand-fed” food to be dropped on the floor/ground where they can more closely inspect it before consumption. Bravo! 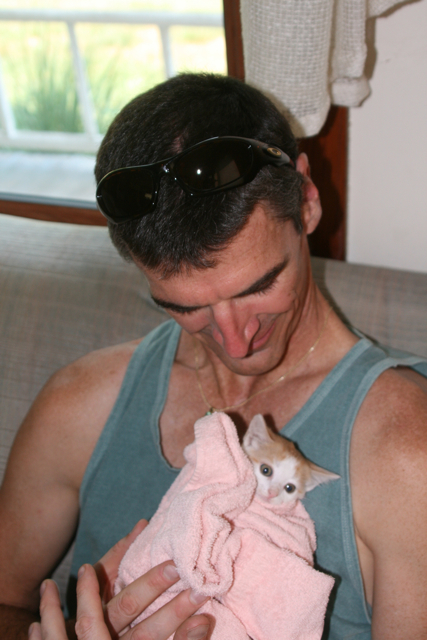 Remembered when you mentioned putting kittens in a SLING to be closer to your body that the pockets of a “hoodie” work well for this although 100 degrees is probably much too hot to be wearing any additional layers. The sling/kangaroo pocket method works well for very young puppies who are “failing to thrive”, as a Newfie breeder friend and I brainstormed. The additional warmth and continual jiggling around seems to stimulate circulation and digestion give them a little bit of a jump-start. And to Deborah and others: I’ll catch everyone up in tomorrow’s blog, but so far it’s good news. Mom (Xena) and 5th kitten were trapped Saturday night, Mom was spayed Sunday and appears to be doing okay, at least she’s been let loose again (after 2 days in a crate), returning to the barn often and eating what I put out. So far, everyone is okay, but I’m aware at every moment that all stories don’t end happily. My little Calico is doing great by the way, she’s a spit fire, totally socialized to people, not impressed by Tootsie in the least and very very ready to expand her world. & blood levels after petting/touching/interacting were significantly higher than before the interaction. What beautiful kittens, they will make great companions. I used to own a former barn cat and she lived to be 16 years old and was a house cat for all of those years and I loved her dearly. Hopefully your cats will be so lucky! I have 3 feral kittens not sure the age. This is day 3 for us I’m very new to this. From the way it sounds you can keep them together to work with them? Thanks for the food tip I’ll have to back track on that one.. Looks like your doing a wonderful job.